The Wizard of Oz (1939) and Oz the Great and Powerful (2013) are about the same world, but were made in different ones. While it would be unfair to pit the two films against each other – especially as one is a classic of traditional Hollywood filmmaking that’s had a 74-year head start in garnering affection – looking at their differences can illustrate much about the considerable changes that have taken place in the intervening years. Considering that Sam Raimi’s production walks around wearing the clothes of another film, like a carnival magician pretending to be a great and powerful wizard, it provides a unique opportunity: with its CGI-blanketed mise-en-scène and climatic Lord of the Rings-style battle, Oz the Great and Powerful could be a state of the nation address for where big-budget American film-making stands in 2013. The Wizard of Oz, despite its abundance of poverty, despair and murder, features at its core a simpering turn from Judy Garland as the unwaveringly decent Dorothy Gale (self-described as “the small and meek”). In contrast, the hero of Oz the Great and Powerful is the Wonderful Wizard of Oz himself, an opportunistic charlatan who is by far the more complex, funny and interesting character. James Franco’s greatest asset has always been his smirk, which can be mischievous or sinister depending on the requirements of the circumstances, and he uses it to great effect. Disappointingly, he is perhaps a decade or so too young for the part: while Franco excels at portraying the magnetism that draws people to the Wizard and the insincerity that eventually pushes them away, he isn’t quite able to convey the hints of desperation of someone who has coasted through their life with a charm that is beginning to fade. The part was intentionally written for Robert Downey Jr., and unfortunately it shows. Beyond its choice of protagonist, the gulf between the two films is most noticeable in their production methods. 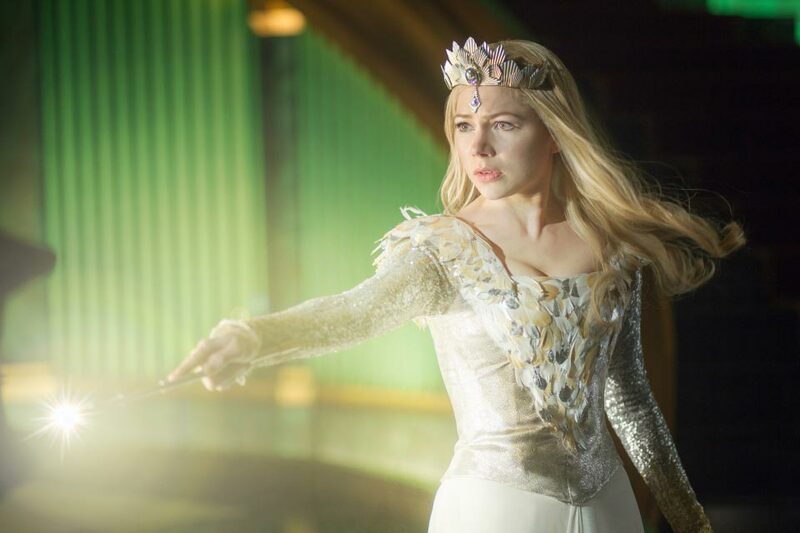 It’s understandable that filmmaking techniques have progressed unimaginably, matte paintings and backlot sets replaced with green screens, but the prevalence of CGI in Oz the Great and Powerful intimates some bigger shift. The omnipresence of CGI creates a luscious world beyond what Wizard of Oz director Victor Fleming could have dreamt of depicting, but in some paradoxical way it ends up feeling more fake. 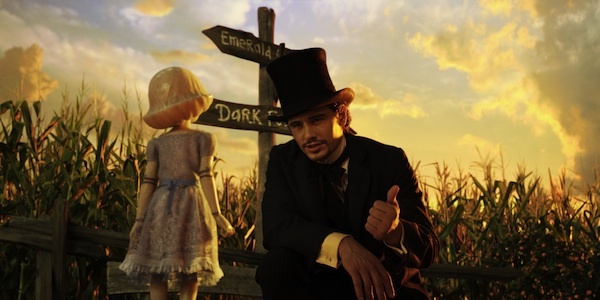 Long stretches of the film are essentially James Franco walking around an animated film, talking to computer generated companions. 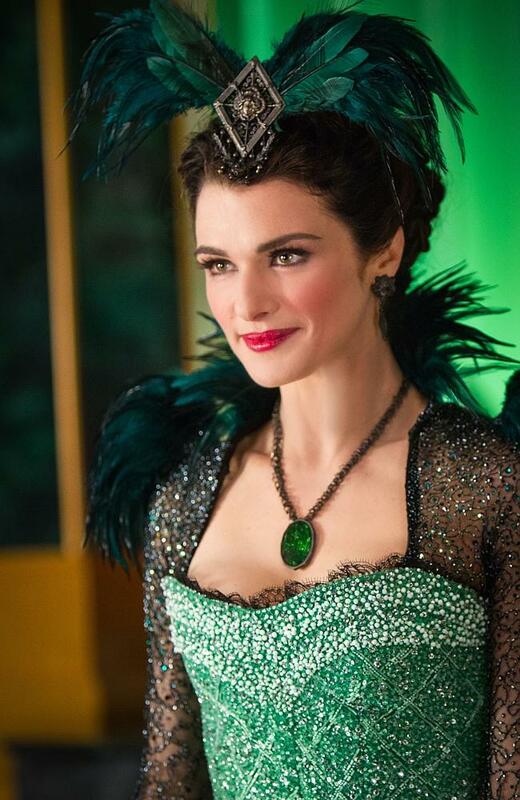 Where The Wizard of Oz cast vaudevillian actors and burned through its face paint budget, Oz the Great and Powerful has Franco’s closest allies as a small girl made of porcelain (whose tragic, genocide-sprung origin is waved away), and a talking monkey with the voice of Zach Braff and the creepy, bizarrely wizened features of an old man. One gets the feeling that if the Scarecrow, Tin Man or Lion had originated in Oz the Great and Powerful they would be rendered in the same way, with impressive but ultimately soulless CG creations. With its camera swooping through CG vistas populated by rubbery digital humans, Oz the Great and Powerful shares more in common with Raimi’s Spider-Man trilogy than his Evil Dead one, and is surprisingly violent. If it seems like the film is too frightening for the young children it’s trying to reach, it might be worth remembering that the flying monkeys and melting witches of the Wizard of Oz likely provoked a similar reaction. Perhaps in 74 years there will be another film set in the land of Oz, perhaps from the perspective of a Munchkin or Toto or a gingham dress, and Oz the Great and Powerful will appear tame in comparison to the witch-filled hellscape it will inevitably depict. Sam Raimi creates some terrific spectacles, particularly with the Wizard’s final trick, and his use of 3D is excellent, but there’s a blandness at play throughout. Marvelous visuals and tart dialogue can only do so much to disguise an obvious, plodding narrative that seems aimed at the very young. For all of the time spent on the Wizard’s moral dilemma, the audience never has any doubt about what he’ll decide to do. Aside from its violent streaks, the film feels like it’s been focus-grouped and homogenised into formulaic mush. Oz the Great and Powerful has been produced with a tremendous amount of skill, but really it could have been made by anyone. The film’s blockbuster aspirations are most glaring during its ending, which ostensibly establishes it as a prequel to the 1939 film but in truth exists to set up a potential franchise. This is reasonable when you consider the hundreds of millions of dollars spent producing and marketing the film, but contrasts sharply with the elegant simplicity of its predecessor, which was content to be a self-contained story even though it was based on a book with over a dozen sequels. This is one of the biggest shifts that has taken place in the 74 years since Dorothy clicked her heels together: there are virtually no films made over a certain budget that won’t be potentially spun into sequels, franchises and endless reboots, whether the story needs it or not.